No one has set foot on Earth in centuries -- until now. It's been 21 days since the hundred landed on Earth. They're the only humans to set foot on the planet in centuries...or so they thought. Facing an unknown enemy, Wells attempts to keep the group together. Clarke strikes out for Mount Weather, in search of other Colonists, while Bellamy is determined to rescue his sister, no matter the cost. And back on the ship, Glass faces an unthinkable choice between the love of her life and life itself. I was super excited to start reading Day 21! 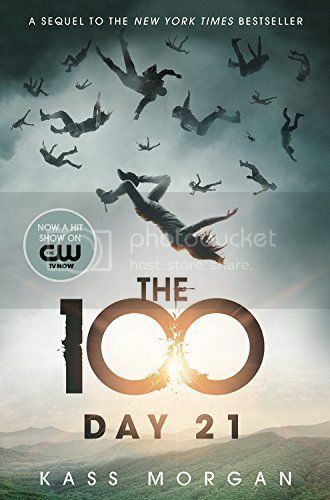 I had read The 100 right before starting the book and I couldn’t wait to get back into the story, especially after that cliffhanger ending in The 100. I was definitely not disappointed after reading this book, and I enjoyed the book just as much as the first book. The story is told from the same character’s point of views as in the previous novel. Clarke is still doing her best to take care of everyone, and succeeding at that. I liked Wells a little more in this book than I did in the previous book. He’s definitely starting to become more of a leader than a follower, and he does a pretty great job as a leader. Bellamy is more determined than ever to find his sister, even despite the setbacks that are keeping him from her. Glass is determined to be with her love, and is willing to do anything to be with him, even some pretty dangerous things. These characters keep the story really interesting, and I enjoy reading the story from each characters perspective. There are also a lot of secondary characters in this series that you will come to care for as well; like Luke, who is super sweet, and Sasha, who is a new character that is introduced in this book. There are also some characters that you are really not going to like so much. The storyline for the book stays true to what happened in the previous book, and I really enjoyed getting back into the world that Morgan created. I love that while this book is a fantasy novel, it feels so very realistic; something that could totally happen in the future. The book ends on quite a cliffhanger, and I’m dying to know what is going to happen next! Overall; I am really enjoying this series so far. Day 21 is a great addition to this series. I’ll be waiting impatiently to get my hands on the next book in the series, as I have TONS of questions that need answers as soon as possible! I read The 100 after watching the series and now I have Day 21 but haven't read it yet! I'm glad I read your review, it made me excited to read it. I have a thing for Bellamy, so I need to get back at it! Sounds like a series worth checking out! I've watched a bit of the show, but it seems to differ from the book.